Hi Scott, where did you grow up and how did you end up at UNH? They had a successful program while you were there, what was that like? I grew up in Stillwater, NY where I attended Stillwater public schools until junior year. I transferred to LaSalle Institute in Troy, NY for my junior and senior year of high school. While in high school at LaSalle I had already been looking into UNH before I had been approached by any schools to play football. I really like the state of New Hampshire and I thought that the school would be a good fit academically. 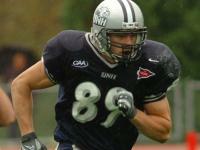 When the UNH program approached me about playing football I was very excited. When I visited UNH and learned about the football program I saw that they had something special that I would want to be a part of. While at UNH I had an amazing experience. Being a part of the team here is one of the best experiences of my life. I love this program and everyone in it. It is more than just a team, it is a family of people who are dedicated to each other. It is more than a place where you just learn about football, it also teaches you important things like responsibility, respect, and work ethic that you will take with you the rest of your life. In high school I primarily played football and basketball. Senior year I also ran track. I ran the 200, 100 and threw the shot and discus. As a tight end you caught a lot of passes. Is that your strength? How is your blocking? If I had to pick one thing I would probably say that my strength is pass catching. My blocking has been something that I have been working on a lot during my career here at UNH. I know it has improved a lot since I first got here thanks to the coaches, but I still know that I have a lot to improve upon in my blocking game. What kind of offense did you run at UNH? We primarily ran a no-huddle spread offense. Do you think you could play both a “move” tight end like an H-back as well as an in-line tight end? What about fullback? I don’t really like to put labels on myself like that. The only reason for that is because it doesn’t matter to me. I would just like to be part of a team. I will be more than happy at any of those positions and which ever one I am at, I will give it my best effort to perform well. Do you think you could bulk up any to prepare for NFL play? Actually, since the end of the season I have added weight. I am currently 252lbs. I have been working hard to make sure that it is all good weight too. What kind of work do you do to improve your hands? I try to get together with a couple players and throw a ball around while running routes at least once a week. I also try and take advantage of down time. I will usually be sitting on the couch watching TV with a tennis ball or something and either bounce it off the wall or just throw it up to myself. I just try to keep my hands and hand eye coordination as active as possible. What is your 40 speed? Will you run at your pro day? I am not sure what my 40 speed is. I will be running at my pro day and I am hoping to run in the 4.6s. What have you been doing to train for your pro day? Once I went back home for winter break I started training with my trainer back home, Matt Phelps. I actually came back to school early in January to start training with Mike Boyle in Massachusetts. I have been training there ever since. How hard do you think it’ll be to adjust from college to an NFL style offense? (Laughs.) I can only imagine. I know it was a big change from high school to college. So I expect that at the least it will be as big as that change. I am just going to work as hard as I can to not only learn the offense, but understand it. Have you played much special teams? Do you enjoy it? While at UNH I have been second string long snapper and first team short snapper at some points. Anything that lets you be on the field a little bit longer, even if it is only one play longer, is always fun in my book. Have you followed the success of the New England Patriots in the last decade or so? Any thoughts on them? I have a deep respect for the Patriots. I think they are not only an amazing team, but a really good organization. I think the thing that I respect most about them is their work ethic. It reminds me a lot of UNH. Have you talked to any teams yet? Do you know which ones will be at your pro day? My agent has been in contact with some teams. I hope that we get a decent amount of scouts at our pro day at UNH, but it only takes one. All I can do is hope that people will be interested enough to come and give it my best effort to perform to the best of my ability. Thanks Scott. Best of luck in your pro day and career. Thank you again. I really feel honored that you have followed me and that you would want to interview me. As chronicled by Peter King in MMQB, after not being drafted, Sicko turned down several UDFA offers, and has decided to continue his education. The very next day, Sicko has decided to accept an offer to sign with the Dallas Cowboys as an UDFA.